I have to confess that I’m not big on New Year’s resolutions, in fact I kind of stink at them! I’ve started some years with great intentions (usually too long a list!) that didn’t last long…or I gave up entirely and didn’t make ANY resolutions. Hey, then there’s nothing to break! But I’m approaching this year differently. I’m just going to choose ONE thing on which I’m going to focus, and really give it my best. It doesn’t mean I won’t be working on other things, but keeping it simple and keeping to one big commitment more likely to stick. I also am also giving this new year the theme “Fabulous ’15” as the motto for this fresh, opportunity-filled year. My wish is that you also have a Fabulous ’15 — and that this is a very special year for you in which new experiences, people, opportunities and adventures come to you and your families. When I thought of the “Fabulous” theme, other words starting with F (OK, just the clean words!) came to mind. Stand up and be counted for a good cause. This is not a call to arms, but an idea to shift our energy off our own goals and challenges and to dedicate it to protecting or advocating for others or for your community. I love the lyrics from Don Quixote’s song in “Man of La Mancha,” “To dream the impossible dream…to right the unrightable wrong.” The full lyrics are here. There are so many needs out there, it can be overwhelming. Yet if all of us choose just one special cause, person or issue in which to some extra time, we can really change the world! I’m striving myself to not let fears, real or imagined, hold me back. The old adage, “Feel the fear and do it anyway” is the way I’m choosing to go. For high performers in this valley, the fear of failure often thwarts innovation and new directions. I’m resolving to be more audacious in my goals and dreams. To embrace risk in a positive way and push myself out of my own comfort zone. When we think of the amazing things that are accomplished, it’s often on the heels of what seemed like failure. I’m encouraged by the famous failures-turned-success of Edison, Churchill, Disney and Lincoln. This article profiles just a few who risked failure time after time — which led to remarkable achievements that changed the world for each of us. Where can you rush in where only fools dare to go? Let’s go forward boldly and dream audaciously! Is there anything that has been on your life or “To Do” list that you’ve been meaning to get around to but it still languishes? How about dedicating some special effort into finally wrapping up that item or action so you won’t be haunted by it — and feel a sense of accomplishment instead? After struggling to revamp the KIT List web site, the new site is almost ready. I will feel SUCH relief when it’s done! Stay tuned for news about the new, more robust site being up! No matter where we are in our spiritual walk, there’s always room to grow more deeply in our faith, and to work on our own rough edges that life, family, friends and experiences help to smooth. In these recent years when I’ve said goodbye to loving parents, close friends and people who’ve inspired and touched me, my faith has given me the strength to face the tough stuff, envelop me in grace to see the meaning in the difficult times and to see how there is a gift and blessing that comes from even the hardest things. I’ve also been deeply grateful to friends who’ve been there for me, and I hope I’ve been there for them in their own challenging times. Illness, death, and hardships come with being a participant on this Earth — and faith and friends give context, meaning and hope to not only endure but to ultimately flourish and grow into a better person as a result. Is there something you’ve been wanting to do to build or strengthen for your future? A new skill to enhance your career marketability — or just to learn something that has always interested you? Better financial planning? I’m an excellent procrastinator for many things on my life “To Do” List. I’ve found that what has really helped me is to have a success team of friends that you meet with monthly (and even do mid-month check-in calls) to help you keep on track and provide what I call “gentle accountability.” It’s good to keep the group small with 4 – 6 people who will commit to each other and to meet regularly. I’ve had various groups over the years who’ve been an incredible help in my setting and reaching short-term and long-term (still in process!) goals. It’s so wonderful to help and encourage your fellow group members and to see the large and small things accomplished. How about starting a group of your own? Also, my sister, Kelly Connelly (and co-moderator of the KIT List) has found Michael Hyatt http://michaelhyatt.com/ to be an excellent resource for free tips, webinars and podcasts on how to really accomplish the things you want in your career and life. He’s upbeat, interesting and highly informative. It’s worth checking out his resources and get things really moving for yourself. Listen to a podcast while driving and get motivated! This is an opportunity for grace. Are there things you need to forgive in yourself, or in others, that will free you for better things? The greatest part about the remarkable story of Louis Zamperini in the book and recent movie, “Unbroken,” is not just his courage and resilience, but his freedom when he ultimately forgave his captor and persecutor in the Japanese prison camp where he was the special target of abuse and torture. Forgiveness through faith ended up freeing him from PTSD and alcoholism — which saved his marriage and restored his life and family. Another favorite book is “The Hiding Place” by Corrie ten Boom, who hid and saved over 800 Jews during World War II, but was ultimately captured and sent to the notorious Ravensbruck concentration camp. Her sister died there, and Corrie experienced much suffering while trying to help and inspire faith and hope among fellow prisoners. But she, too, was able to forgive a brutal guard, and the entire nation, and she spent time after the war helping to heal and rebuild people in shattered Germany. Corrie dedicated the rest of her life as a “Tramp for The Lord” (the title of her 2nd book) traveling the world to share the story of redemption, love and forgiveness. This is that time of year that we all start with renewed zeal for exercise and health. I don’t happen to one who loves this naturally, so I have to find ways to make it fresh, fun and more enjoyable. I’ve found it a HUGE help to have workout buddies. I’ll get my reluctant tail to the gym or out on a bike ride when I’ve made a commitment to someone else. Thank you to my friends and family over the years who have been great fitness buddies. I may not like working out, but you make it much more enjoyable! Is there someone who can help you try a new sport or new routine? It goes without saying how important family and friends are in enriching our lives. We all know that time is precious and fleeting. No matter what our age, health and just being alive can’t be taken for granted. Work and other commitments make far greater demands on our time in this era. What are ways you can build in more device-free time with those you love and experience new things together? During this holiday season, my family and friends actually spent time doing old-tech games like Charades and Taboo (pretty hilarious). We also did hikes and bike rides, cookie baking/decorating, going to the beach (the source of this blog’s photo! Carmel was beautiful and we saw a large pod of dolphins frolicking in the waves. What a delight!) and other relaxing things that were just a great way to spend time together. Slowing down and finding new ways to enjoy time together will reap many rewards in our over-programmed society. Also, is there a way to add new and interesting people into your circle of friends? They can open up new horizons and experiences for you, too. People, habits, jobs…it’s hard to accept that change is a natural and important part of life. Sometimes we have to say goodbye to loved ones who’ve died, or to jobs that no longer fit us, or to habits that don’t serve us any longer. I’m learning to embrace change more (it’s a challenge for me!). Instead, I’m looking to find ways to try to get ahead of the change curve (what new trends, learning, skills, talents will be tapped?). I realize that while nothing really ever stays the same, how can I make change work to the positive — and mitigate any possible negative impacts proactively? In the midst of the hectic pace and overbooked lives so many of us face, let’s be sure to allow ourselves time for pure FUN — with family, friends and new people. Now that even kids’ sports have become so competitive and stressful, we’ve lost the element of fun, learning, exploring, making mistakes and bumping into new and unexpected things! We need free time for true “re-creation.” Unstructured time without electronic devices allows for better ways to tap into our creativity. A good laugh, or even a smile, releases endorphins into our bodies. When was the last time you allowed yourself to just have fun? I know, this is a long list, but just choose ONE thing to differently. You’re more likely to be able to stick to it for the long run this year. Keep it simple and avoid the temptation to have a long laundry list of resolutions. Choose one theme on which to focus and REALLY make a difference that you can appreciate and be proud of at the end of this bright, new year! I’m going to do the same. If you’d like to share your own ideas or themes for the New Year, please add your comment below! 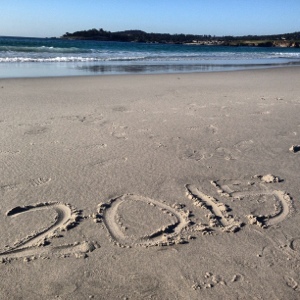 Kelly, Amy and I wish you a FABULOUS 2015 ahead!